Sewing straight lines is pretty basic when it comes to sewing. I don't know that it can really be considered a technique, but more of a necessary skill. Unfortunately, sewing a straight line isn't always as easy as it sounds. So, I thought that I'd share a few tips and tools to help keep those lines and seams straight. 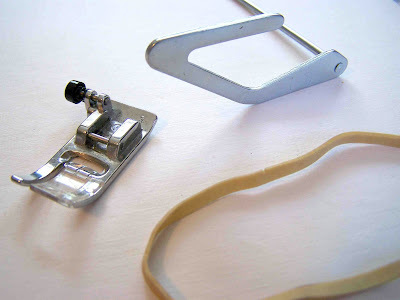 Basic presser foot, quilting guide, rubber band (in case you didn't know). 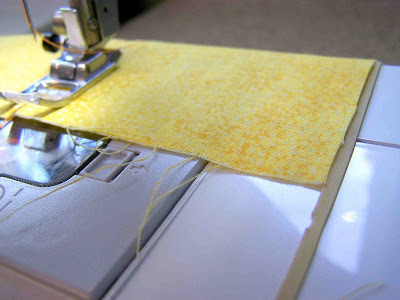 Your sewing machine has a lot of built in tools that are ready to help you obtain those straight and even stitching lines. If you understand what those tools are, and how they work, they are quite helpful. The presser foot for example is made to not only assist the fabric as it is fed through the machine, but in and of itself is a guide for straight line sewing. For example, my standard presser foot has three notches, each of those little notches is an indicator of distance. For example, the one on the far left indicates where my needle hits, and where the stitching line is formed. The center mark is 1/8 inch from the stitching line, and the far right mark is 1/4" from the stitching line. Your presser foot may be different, so if you're unsure of the marking measurements, bust out that ruler and figure it out. I also know that my presser foot is 3/8" at the end of the clear plastic, and 1/2" on the outside edge of the foot. Knowing this, makes sewing straight lines that much easier. My presser foot has a clear toe at the end of the foot. 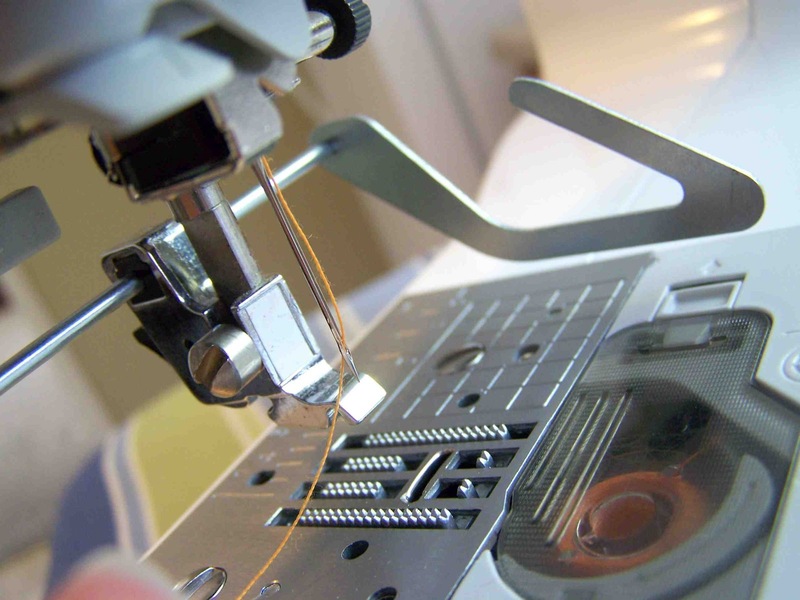 The clear plastic is very useful in aligning previous stitching lines with those marking indicators. For example, if I want to add some topstitching 1/8" away from the garments edge, I can make sure that the material is properly positioned before it ever reaches the marking. 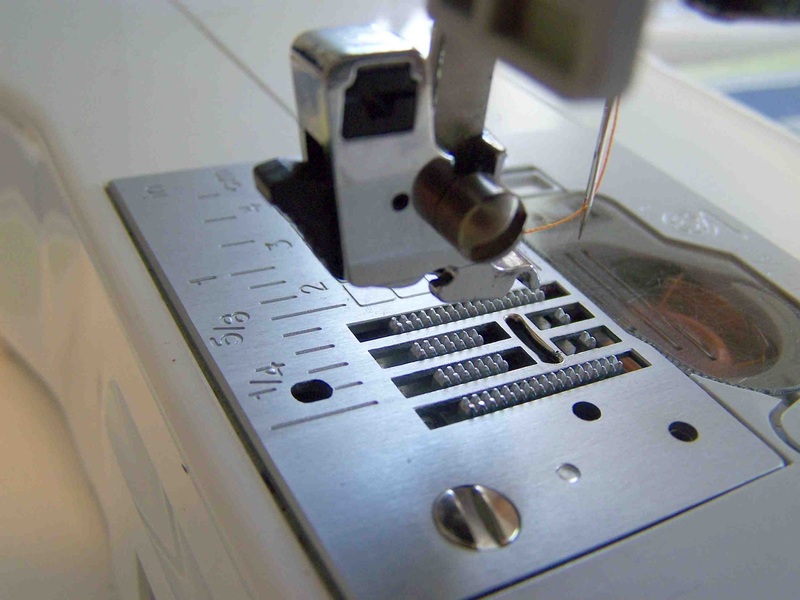 The needle plate of your sewing machine will also have useful measurements and marking. Mine has several markings both in inches and centimeters. There is a small grid that correspond with the markings. 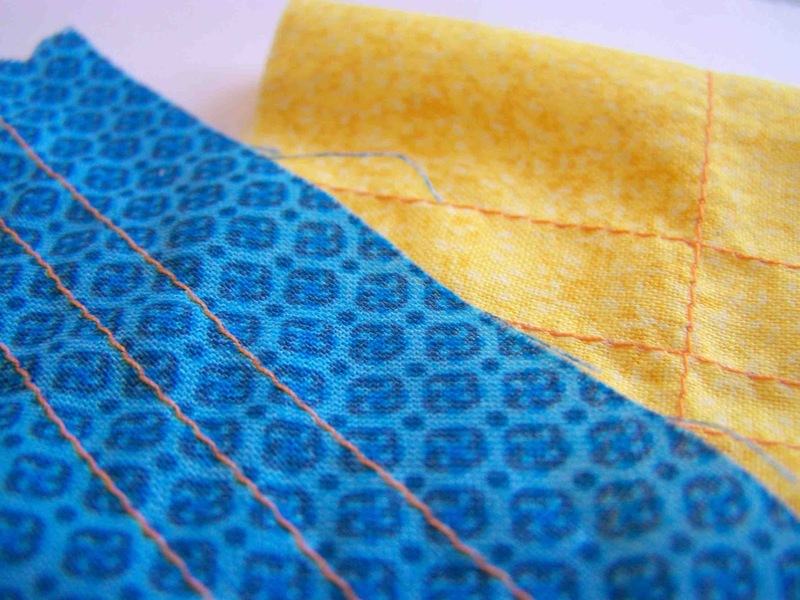 Aligning the raw edges of your seam with the grid lines can help keep the seam even. 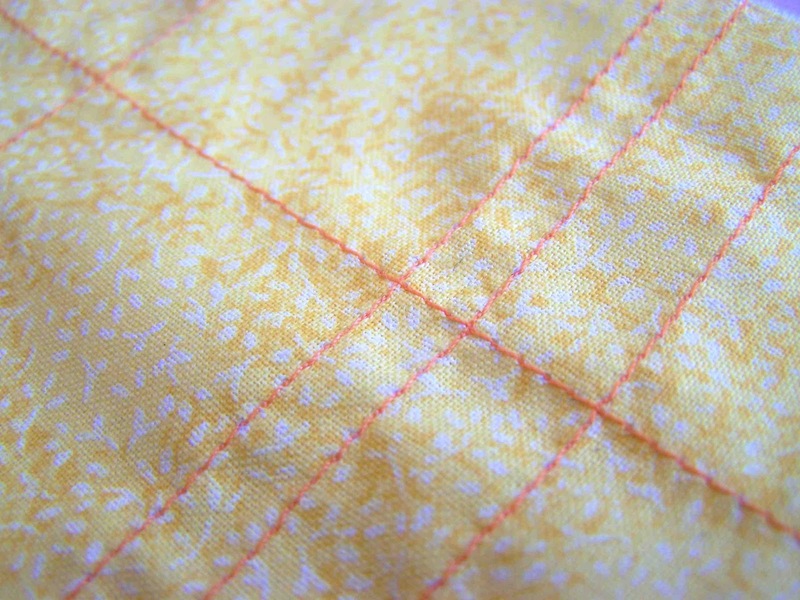 My needle plate's markings go up to about 2 inches, they are really helpful if you are sewing standard seams. 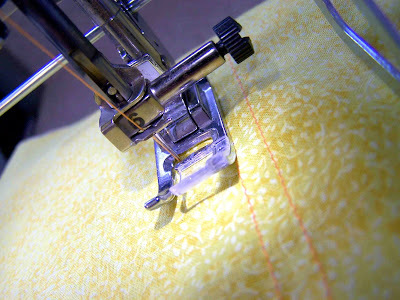 To achieve a straight stitching line, the most important part is to maintain the fabrics position. Even if the seam itself isn't straight, you want to keep the raw edge of the fabric aligned with the appropriate marking, be it on your presser foot or needle plate. 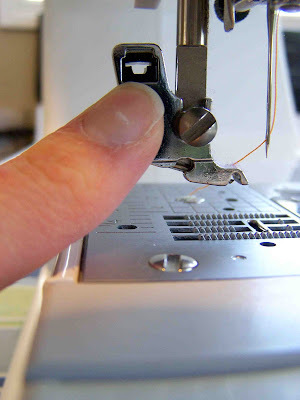 If you are sewing parallel stitching lines, you can use the presser foot as a guide (1/2" in this case), to create stitching lines that are equal distance apart. At times you may have stitching, or quilting, to do that is spaced further than a presser foot width apart, or even larger that the markings on your needle plate. In this instance a quilting guide can be quite helpful. My quilting guide came with my machine, but most machine makes have them available for purchase if it didn't come standard with your machine. 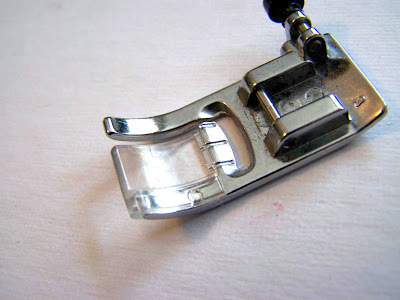 My quilting guide slides into the presser foot holder, through a small rubber opening. It is a tight squeeze, but because it is, the guide is held in position. You can move it right to left to adjust it's position. The guide is great because, if you are sewing multiple stitching lines, often times the needle plate markers are covered by the material. 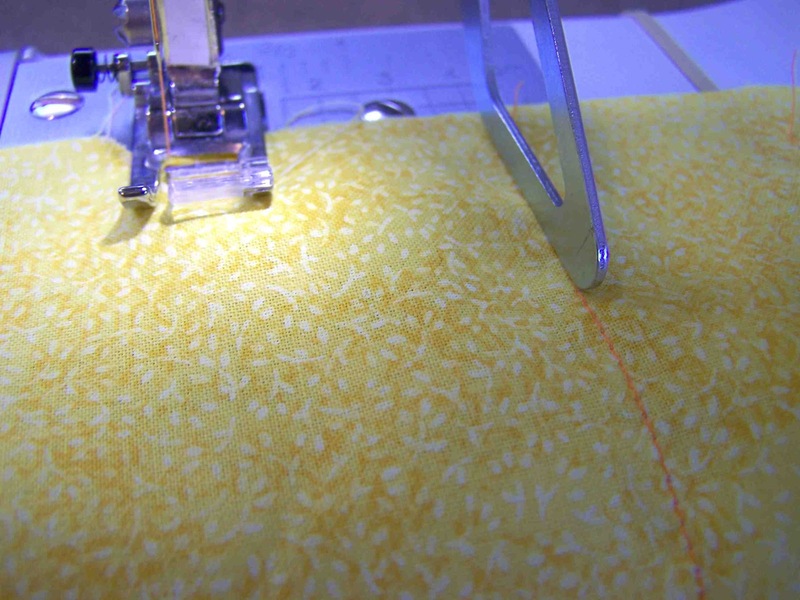 The guide allows you to mark your position, and maintain straight sewing lines. My guide has a tendency to bend outward a bit toward the front of the guide. Since I'm aware of this, I can choose where I'm aligning my stitching lines (front or back), and then maintain that position. 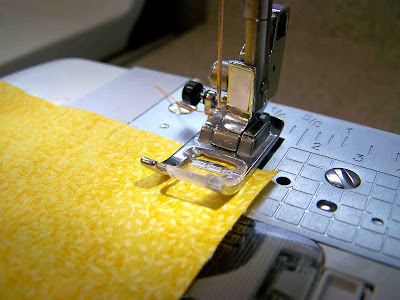 I love using this when sewing my tortilla cozies, baked potato bags, or even quilting a quilt. It is really a handy tool if you sew/quilt a lot. If you don't have access to a guide, and need a wide marking guide, you can slide a rubber band onto the arm of the sewing machine and position it parallel to the needle plate. You can align the raw edges of the material with the band, and sew just as you normally would. Because the band has a bit of thickness to it, it tends to keep the fabric in it's place a bit better. If you happen to need to cover the band with the bulk of the material, and still use it as a guide, you can feel the band's position, and align the material by touch. Something that I saw my mother do growing up, was place a bit of tape on the needle plate to mark her desired seam allowance. If you get confused while sewing, or don't sew often enough to remember what the markings are, this might be useful to you. I'd recommend folding the tape onto itself on one end, just so that you can easily remove it when you're finished. Remember that if your needle position changes, your markings measurements will also. These tips and markings are useful in achieving an even seam no matter the shape of the seam or stitching line. Even if you are doing some circular stitching, watching the material's position to the markings, and gently easing the material through the machine will help achieve an even stitching line. Do you have any tips or suggestions on achieving a straight and even seam? I'd love it if you shared. A stack of mini post-it notes (or a magnetic seam guide for noncomputerized machines) can also be stuck to the arm at distances other than what is premarked on the needle plate. I also try to support the fabric as much as possible (not let it drag off the table) as I feed it through. I put a couple of layers of tape on the seam allowance line I'm going to use, making sure the edge closest to the needle is right on the line. This way, I can put the fabric through the machine, and the pile of tape keeps it from going over the line. Works like a charm! I use electrical tape, but you could use post-its for a moveable line. As a person you should know what are your priorities and goals so that it is easier for you to determine and decide when is the time to give up or go on. Thanks for sharing such a wonderful article, I hope you could inspire more people. Visit my site for an offer you wouldn't want to refuse.